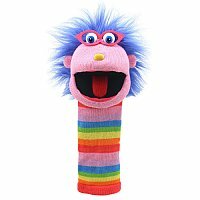 Gloria Sockette Hand Puppet give kids a wonderful jumping-off point for imaginative play. These crazy critters have funny monster faces and a squeaker in their tongue, so the monster puppets can "talk" even if you don't talk for them. Kids can use their Gloria Sockette Hand Puppet in a puppet theater, or improvise their own theater using the back of the sofa. Or, parents can use him to tell funny bedtime stories, or just make kids giggle with puppetry and wacky voices. They can also be used as a classroom buddy or a subject buddy for an individual child to help with a particular subject or topic a child finds difficult.